I went back to Harvard last October, and there were Asians and Asian Americans everywhere. 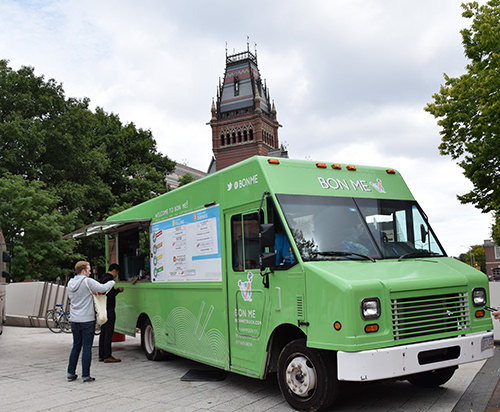 I even saw a Vietnamese sandwich truck at the foot of the Science Center, just outside the gates of Harvard Yard. Of course, it was outside. But not your big banh mi truck. In the yard, there were Asian tourists galore, fawning all over John Harvard’s statue, just to be near that lucky gold toe that’s supposed to be good luck if you touch it when you apply for admission. 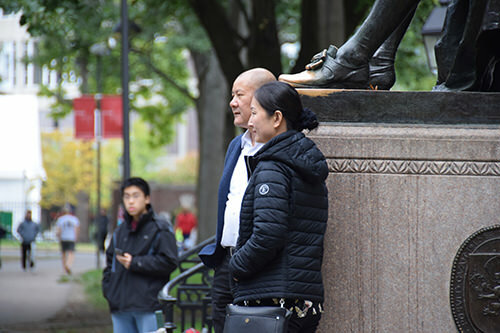 I saw one Chinese family at the foot of Widener Library, who were hoping that their daughter would return as a freshman someday. But on this day, I think they just wanted her to take their picture in focus. Of course, they were the real winners in the equation: the proud parents of a future Harvardian. Welcome to the 21st Century Harvard, where Asians abound. Last Thursday, the fat and skinny letters went out. If you got a skinny one, my condolences. At least you’re thin in something. But if you got a fat one, the one that comes with a certificate saying you got in, what I call the pre-diploma, then congrats. This year, Harvard admitted more Asians than ever. Overall, there was a record number of applicants–39,041. Pity the one who was late and could have been the 39,042nd. Of the pool, 2,307 students were admitted. Asian Americans made up 22.1 percent of the freshman admits, a record for the entire school, not just the orchestra’s string section. The stats also revealed a record for African American students–14 percent admitted. Latinos were at 12.7 percent (last year, it was a record 13.3 percent); Native Americans were at 2.2 percent, up from 1.5 percent. And Native Hawaiians were slightly off, to .4 percent of the class from .5 percent last year. Add up all the figures, and my arithmetic show that’s about 51.4 percent, making it a minority-majority freshman class. No big deal, right? We already have a few minority-majority states, like California, New Mexico, Texas, Hawaii, and the District of Columbia. Now here’s the model for the modern Ivy. Gender-wise, women were 48.4 percent of the class. About the same as last year. Still, overall the demographics have improved. When I was a student in the late 20th century, Harvard was still separate from Radcliffe. Gender equity? Not quite there in the 1970s. It was about a decade after the Civil Rights Act, and Harvard was still trying to get it together on black and white issues. As for Asians? It was about nine years after the racist quotas on Asian immigration were lifted with the passage of the 1965 Immigration and Nationality Act. It took some time before things were much different at Harvard. The only Asians I ever encountered were mostly foreign patricians. Sometimes they’d talk to a son of a fry cook. Most of the time, I worked dorm crew. Imagine how things have changed. In my day, it also cost $5,000 a year to attend the school. It now costs in excess of $65,000 to attend Harvard. One thing I liked about Harvard is that if it admits you, they will make sure money isn’t an issue. My parents, a retired cook and a housewife, never made more than $10,000 a year. I couldn’t have gone to Harvard without the school’s generosity. Or without working 2 to 3 jobs myself. Harvard likes to say the school costs the same or less than most public universities for 90 percent of American families. If you’re from a family with an income less than $65,000, you pay nothing toward your education at Harvard. The school says that’s true for about 20 percent of its students. But don’t mistake Harvard for being Cal State Stanislaus in Turlock. All this warm and fuzzy Harvard news may not be an accident. Currently, Harvard is under attack from all different sides. One group of mostly Chinese students says Harvard discriminates against Asians and Asian Americans and blames affirmative action. Another group that is helping out the litigious Asians wants Harvard to offer tuition-free schooling to everyone, in order to open up the school’s records. So here’s Harvard gushing about how its brand of elitism is really quite equitable. It has awarded nearly $1.5 billion in financial aid to undergraduates since 2005, and look at all the minorities the school’s letting in! Why, it’s practically a public school! We’ll see how that plays in court. In the meantime, as a visiting alumnus, I’m encouraged by all the changes. In October, seeing Asians everywhere made me feel like I fit in. At the Lampoon, I met the humor organization’s female VP, Sierra Katow, a rising young Asian American comedian who made a splash last summer on NBC’s “Last Comic Standing.” In October, she presented Jimmy Fallon an award on the Lampoon steps. But typically Asian, the Southern Californian is a computer science major just in case she doesn’t become the second coming of Tina Fey. Now that would be a nice footnote in Asian American history, fully appreciated if Harvard had a real Asian American Studies department some day. In the 1970s, I had to go from California to deep in the history stacks at Widener to find out just how Asian I was. If I were there today, I’d be able to see it even outside, all over campus and maybe next to the banh mi truck.